I did some nice riding over the weekend. It was nothing spectacular, but very enjoyable. As seems to be usual for short, local rides, my camera was along but didn’t make it out of the tankbag. I had intended to make it up to the TWTex Pie Run 250 miles away in Lake Fork on Saturday. I had been eying the weather forcast right up to Saturday morning, feeling more and more positive. I awoke at 6AM to dark skies and pouring rain. The radar was very “green” on top of my house and for what would be the first hour of riding. After some of Dad’s yummy waffles, I designed a shortened Piney Woods route to get me out of the house and on the R1200ST for the first time (one commute doesn’t count, right?) since my ride to Pensacola. I really wanted to ride FM1725 between Cleveland and FM150 again, so I headed that direction. Between a 1.5 lane farm road, a pavement-ends turn-around situation, and a 10-minute pouring rain cloud, it was a very pleasant and adventurous outing. Patricia had organized an afternoon ride on Sunday. 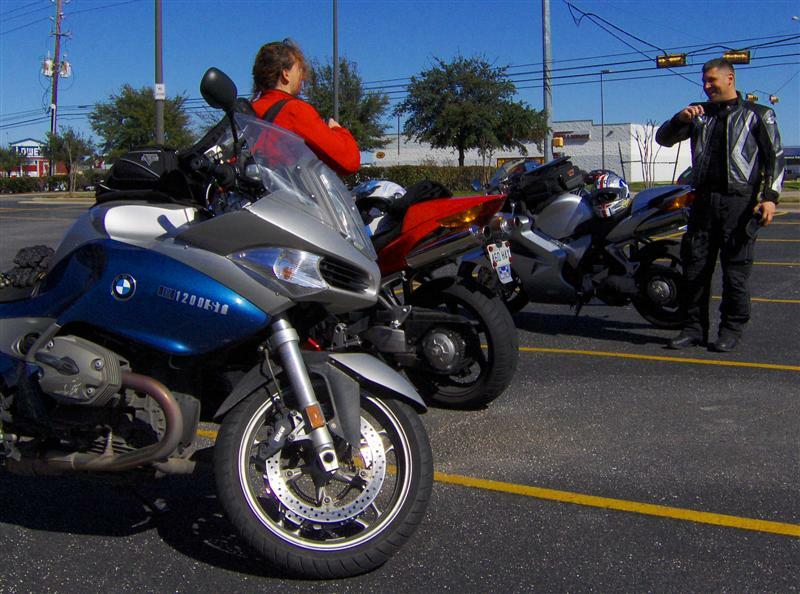 I met up with her, Billy & wife/pillion Anna, and Ronnie for a pre-ride mocha while we decided on a route. Patricia had a route out to Fayetteville loaded in her (Gavin’s) GPS, but she really didn’t want to lead the ride. I don’t know the Fayetteville route well enough to lead it, but I DID know a fun way to run up to FM3090 in Navasota and then back around on FM149 through the forest. Surprise! Surprise! I ended up leading the four bikes north through my route. Those who know me know that I don’t generally enjoy leading group rides. I won’t go over my usual reasons ad nauseam because this ride turned out to be the exception. We ended the ride with a late lunch at Phil’s in Montgomery, one of my local favorites!